Designed for application on hydraulic power steering of any car that uses transmission oil Dexron ATF (red oil). Lubricant Composition Atomium HPS 60is designed for the treatment of hydraulic power steering of any car that uses transmission oil Dexron ATF (red oil). The 1st stage: Add Lubricant Composition Atomium HPS 60to the working oil of the hydraulic power steering at the rate of 30 ml of the Lubricant per 1 liter of Hydraulic Fluid. After applying Atomium HPS start the engine and steer (left-right to the stop) 15-20 times, then drive the car in a regular mode for no less than 20 minutes. Run till the next regular Hydraulic Fluid replacement (1200 -2000 km). The 2nd stage: Add Lubricant Composition Atomium HPS 60to the working oil of the hydraulic power steering, then drive the car in a regular mode for no less than 20 minutes. Before applying LC Atomium HPS shake the can thoroughly until natural sediments (active components) are totally dissolved. 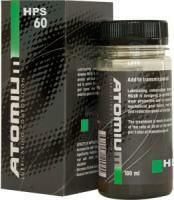 Apply LC Atomium HPS through the regular filling neck of the hydraulic power steering. After applying Atomium HPS start the engine and steer (left-right to the stop) 15-20 times, then drive the car for no less than 20 minutes in any mode (regular operation). It is recommended to carry out Atomium treatment of the hydraulic power steering together with engine and transmission processing at the same time or sequentially. LC Atomium HPS is compatible to any type of Hydraulic Fluid (ATF - Synthetic Automatic Transmission Fluid (the red oil) and doesn't change their properties. To provide continuous level of protection of the unit it is recommended to apply LC further after each oil change in transmission.